Speak up for Sidewalks and Schoolkids! Did you see the news this week that nearly $3 million that would have funded sidewalks and crosswalks for schools has been siphoned into the city’s “general fund”? 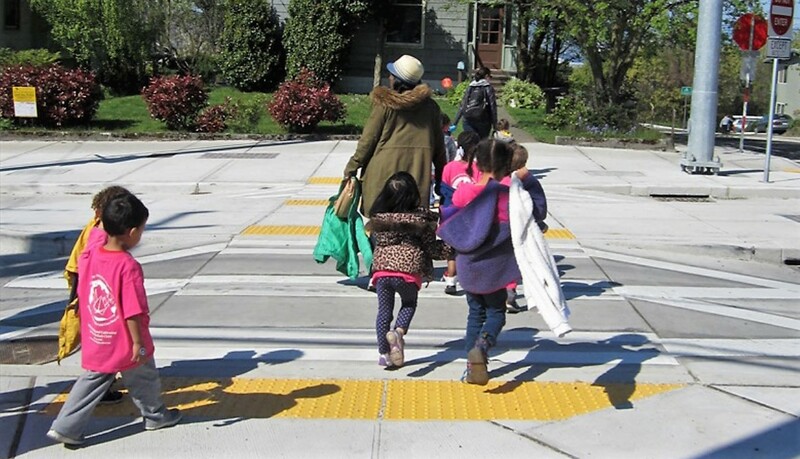 We need you to speak up now in support for funding sidewalks and crosswalks so that kids in Seattle can get safely to and from school. Seattle Neighborhood Greenways has championed the Safe Routes to School program since our founding in 2011 as a core piece of our work. We’re committed to making every neighborhood a great place to walk and making sure every child can safely walk to school. But in order to do that we need our city leaders to increase funding for safe routes to schools and sidewalks. We need you to act now and send a letter to your councilmembers asking them to ensure that Safe Routes to School are adequately funded and kids can get safely to and from school. P.S. 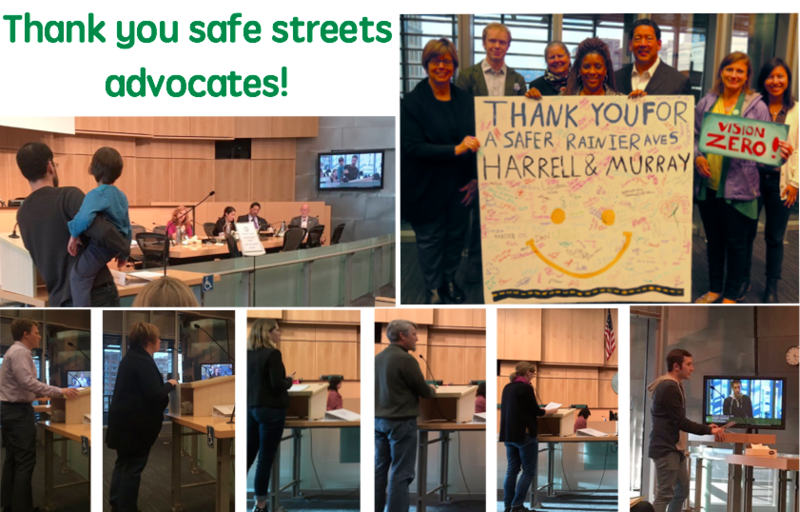 Whether or not we win back this funding, Seattle Neighborhood Greenways will continue to advocate to adequately fund safe routes to school and sidewalks next year, and hope you will stay engaged in this effort. Sign up here to volunteer with us or Donate here. Thank you. Tom Rasmussen has chaired the Seattle City Council Transportation Committee for years. 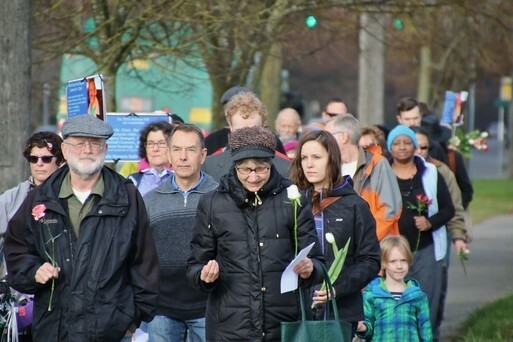 While Bertha, streetcars, unprecedented traffic congestion, and freight take a lot of his attention, the Councilmember has remained attentive to the needs of people who walk and bike. I have requested [Seattle Department of Transportation] SDOT to continue to work to improve mobility and safety for everyone around construction zones. One of the first tours I organized for Mr. Kubly [SDOT Director] was of one epicenter of construction: the Pike/Pine neighborhood on Capitol Hill. We have had a number of updates and briefings from SDOT about their work to ensure compliance by contractors and progress is being made. 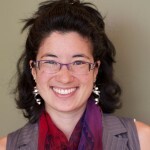 Thank you for speaking up for people who walk and bike. We need strong support from our leaders all over Seattle! Seattle Pedestrian Advisory Board (SPAB) member Jacob Struiksma took one look at a May 26 letter from Seattle Department of Transportation (SDOT) and called into question the plan for a Complete Street along a busy retail corridor. This is crazy that curb bulbs not going to happen at all the intersections on Roosevelt Way. Why do people that walk have to be second to everything? Why do people that walk get the short end of things all the time? Jacob’s quick response alerted fellow SPAB members and the Washington State pedestrian group Feet First about safety improvements as SDOT repaves Roosevelt Way NE. Both groups will review this new twist on Complete Streets and Vision Zero in their policy discussions in the near future. 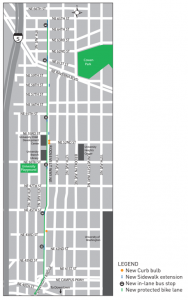 A robust Complete Streets Policy is one of Seattle Neighborhood Greenways 10 advocacy priorities for 2015. 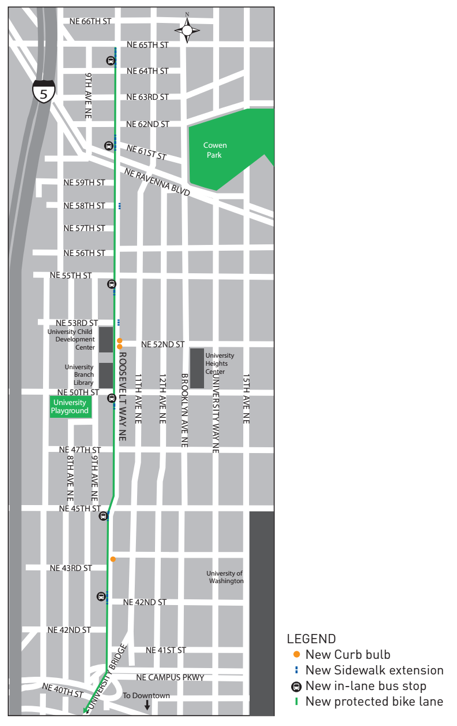 SDOT will periodically distribute project updates about the Roosevelt Paving & Safety Improvement Project. Curb bulbs extend the sidewalk out, typically into a parking lane at intersections, in part to ensure that curb ramps (wheelchair ramps) meet the federally mandated standards of the Americans with Disabilities Act (ADA). They have the additional benefit of making pedestrians more visible to motorists, and vehicles more visible to those pedestrians. They also have the effect of shortening the crossing distance for these pedestrians. As such, curb bulbs increase safety for pedestrians, and seem to enjoy broad community support. Sadly, the curb bulbs and enlarged tree pits were determined to be the most logical project elements that could be eliminated and bring the budget back into balance. The curb bulbs were initially included in part to provide adequate room for standard curb ramps. However, we were able to accommodate the ramps and meet design standards without the curb bulbs in most locations. 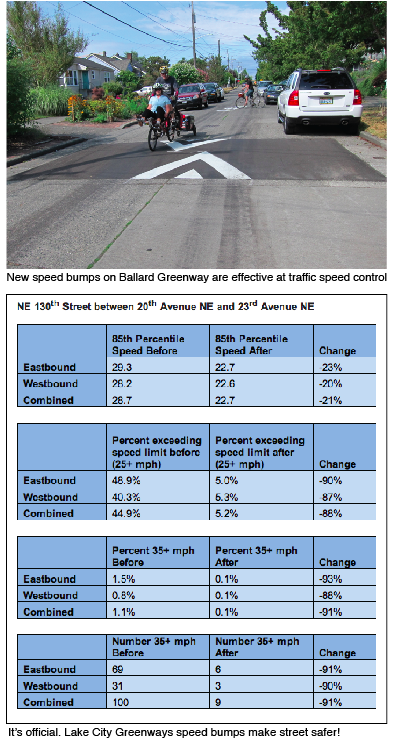 We look forward to using a safe, welcoming Roosevelt Way NE in the coming years.